On October 2nd, America lost a Rock ‘N Roll institution. At age 66, Tom Petty passed away from apparent cardiac arrest. This day of course, coincided with the horrific massacre in Las Vegas. As a result of that tragedy, and the shock of Petty’s unexpected death, I wasn’t ready to put a proper tribute to print. This evening, some three-plus months later, the toxicology report of Tom’s death was released. Sadly, Tom’s death was preventable. He died of an accidental prescription drug overdose. The previous week, he and his band mates just concluded a 53-date tour commemorating the 40th anniversary of their band. Turns out Tom powered through the tour with a broken hip, and was suffering from other long-term health ailments I was unaware of. His pill regime read like a list akin to that of Michael Jackson or Prince. Following the long tour, his physical pain got the better of him, he hit the pills too hard, and it was more than his heart could bear. Sad. The release of these latest findings got my mind back on the life of Tom Petty, and I feel encouraged to put some words to what this man and his music meant to me. If Tom Petty’s career was a play, I view it as a series of Acts. Act One produced some of his biggest hits and brought fame and stardom to his band, The Heartbreakers. “American Girl” was the song that put them on the map, but 1979’s Damn the Torpedoes was the album that made Tom and his band mates superstars. “Refugee”, “Even the Losers”, “Don’t Do Me Like That”, and “Here Comes My Girl” highlighted this American classic album and went on to be some of TP’s most timeless hits. The next six years saw the release of albums Hard Promises, Long After Dark, and Southern Accents, which produced hits such as “The Waiting”, “Woman in Love”, “You Got Lucky”, and “Don’t Come Around Here No More” to name a few. 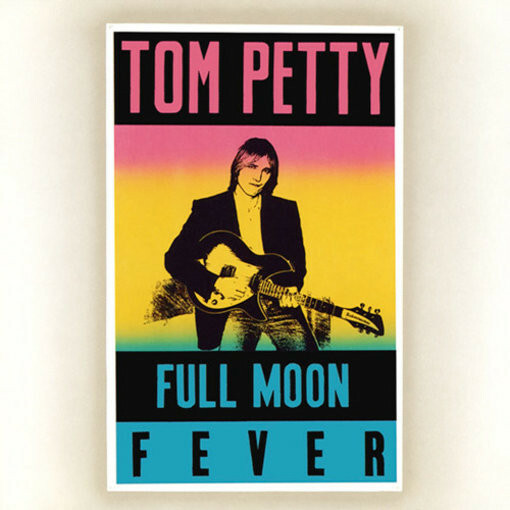 To call Full Moon Fever a true solo album is somewhat inaccurate. His right hand man, guitarist, and song writer Mike Campbell was on board from day one. Other members of the Heartbreakers were called in to eventually record on the album as well. Yet this album wasn’t billed as a Heartbreakers album. It was a personal album to Tom. It was his baby. The album was a smash hit. “Runnin’ Down a Dream”, “I Won’t Back Down”, and the megahit “Free Fallin'” officially put Petty back on the map as a major hit maker in the music industry. Most critics considered it his best work in a decade. This was the first Petty album I owned. I had it on cassette, much like the image above. Over the next decade or so of what I consider “Act Two” of Petty’s career, he made several more successful albums with the Heartbreakers, as well as another critically and commercially successful solo album called Wildflowers. I owned every one of these albums. Whereas I knew of Tom Petty in the ’80s, throughout the ’90s and into the early 2000s, I was a bona-fide Tom Petty and the Heartbreakers fan. 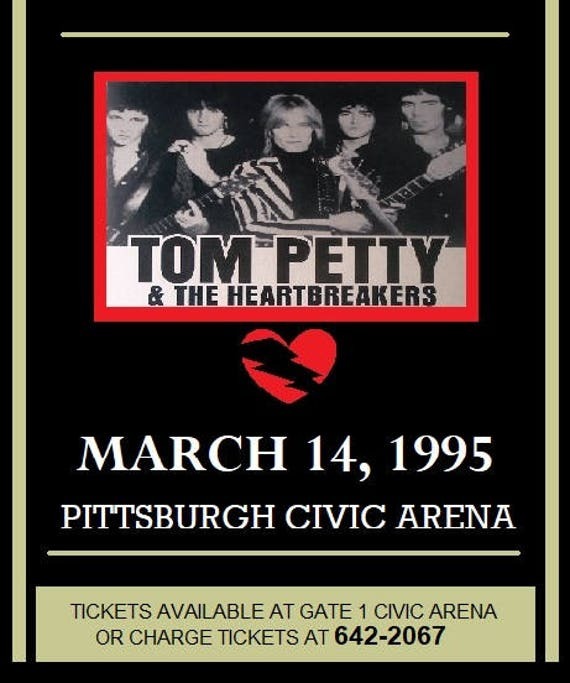 My highlight as a Petty fan came in 1995, when I got to see the Heartbreakers in concert for my first and only time. No, I wasn’t at the Pittsburgh show in that picture. I actually saw them in my hometown. I was living in Bloomington at the time, but me and two college buddies drove up to South Bend to see them at Notre Dame’s Joyce Center. For my money, there’s no more enjoyable place to see a concert than Notre Dame. 8,000-seat venue. Not a bad seat in the house. It was early in the tour. Third gig to be exact. The show was outstanding. I have a special memory from that show: For well over a decade Tom had refused to play “American Girl” in concert. He grew to hate the song over the years, and they simply never played it live. Well you could tell that Tom and the band were having a great time that night. High energy. A lot of smiles. A lot of laughs. The vibe was great. When they came out for the encore, Tom asked the crowd, “Do y’all wanna hear somethin’ old or somethin’ new?” The crowd of course shouted in unison, “Something old!!!!!!!!!!! !” Tom then said, “Well, then I think we’d like to play a song we haven’t played live in really long time…..it’s called American Girl.” In came the guitar and off they went. The crowd went nuts. What a memory!!! Two other takeaways from that show….Oh my God Mike Campbell is an insanely great lead guitarist! Perhaps because of his unassuming, even shy persona, but that dude has never gotten his due. I’m telling you straight, Mike Campbell is TOP TEN all time folks. The other takeaway would be that night was the most pot I ever smelled in one place in my life. After a decade or so of buying every album they released, I sort of stopped following TP in the mid 2000’s. Over the past 12 years or so he and his band kept doing what they always did. Make new music and play more gigs. Perhaps some of the new stuff was good. Maybe some of it wasn’t. Perhaps they sounded as good as they always did in concert. Perhaps they didn’t. The thing is….it didn’t really matter anymore. After 40 years of hits and Hall of Fame induction, Tom Petty and the Heartbreakers crossed that threshold into Rock institution status. Icons. Legends. Several friends of mine saw them on tour last year and all said they still sounded great. I’m really happy to hear that. Tom Petty was a rare bird. His voice was weird, but it sounded good. He wasn’t overly handsome, but women still thought he was hot. His lyrics were different, but you could relate to them. His contemporaries loved him and enjoyed performing with him. Younger artists admired and were inspired by him. Actors, whether in his music videos or at shows, loved being around him. Athletes dug seeing him court side at Lakers games. Tom Petty was, in a word…………..cool. 66 years old is too young to pass. But while he lived he gave us a lifetime of great music and memories. Thank you for all of it TP. I know you’re rockin’ up in Heaven. Next Post The Super Bowl!